And I love the bright pepto-bismol egg carton! Out with the chewed-up, dingy grey! The carton and its contents make me smile. Chris and I were delighted to see a bunch more apples in this week’s box from Beech Creek Farms. 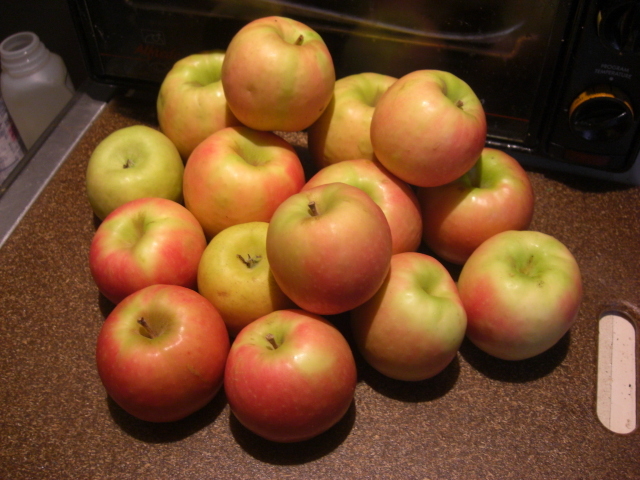 These apples are wonderful in texture and flavor. And I’m not talking wonderful-for-January apples; I’d be thrilled to get these in September. I’m so pleased that they store this well. 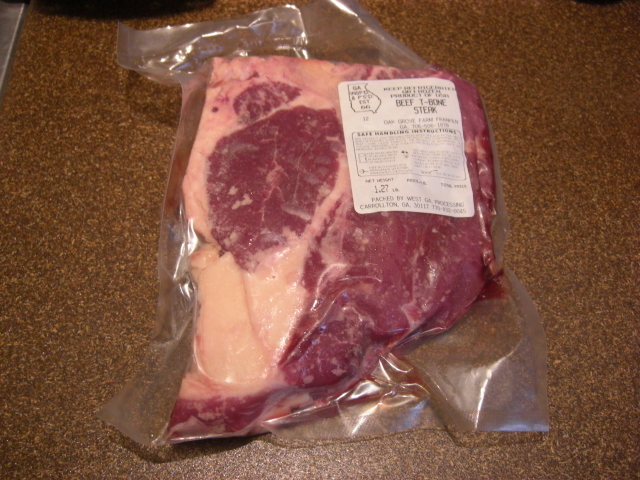 but I have no idea what to do with a T-bone steak. I’ve never cooked nor eaten one. For now, it’s in the freezer with the butter while I do some research. 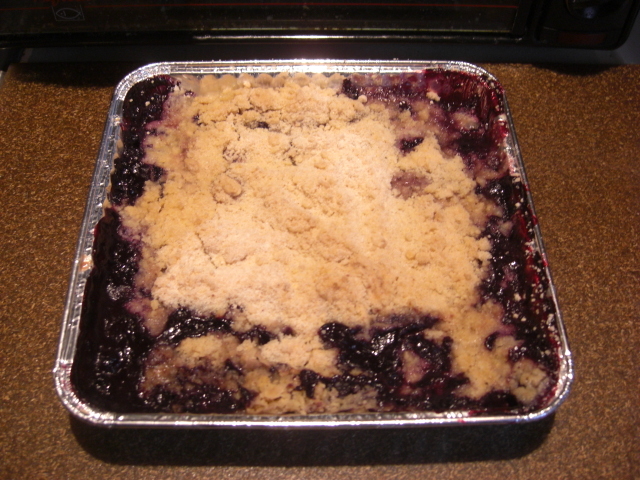 On the other hand, I know exactly what to do with this blueberry cobbler that was part of this week’s delivery. 1. Reheat in oven. 2. Give Chris fork. 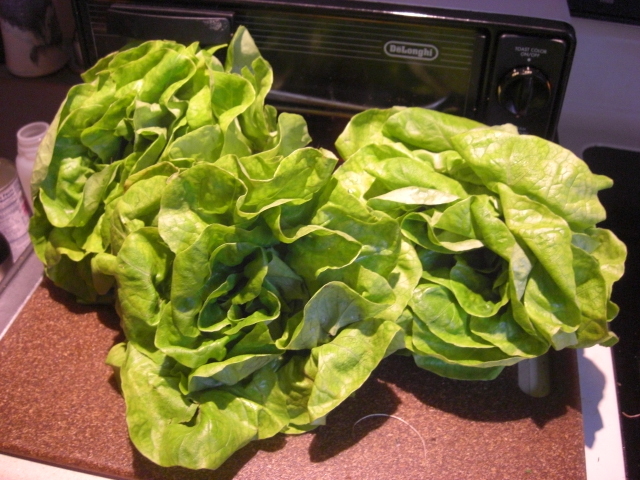 In the Farmers’ Fresh newsletter, Patricia wrote that Owl’s Hollow Farm had damage to one of their greenhouses from the big winter storm and had to harvest a mess of hydroponic butterhead lettuce. Here’s my share. This is a good example of what it means to be in a CSA and tie your food consumption to local ground. Stuff happens. And sometimes stuff happens and you get a windfall of lettuce. So you eat lettuce until your ears fall off, and then relative normality returns until the next challenge. Will you believe me when I tell you that’s one of the most satisfying parts of belonging to a CSA? I think it’s because you know you’re connected to your food and that it has meaning beyond any particular craving of the moment. It’s not like this is really an absurd amount of lettuce – I just doubt Chris and I can get through it before it loses all of its charm. (Plus, we still have a head of Romaine from the last delivery.) While amazingly delicious, local soft lettuce is neither versatile nor long-lasting. Some neighbor veggie karma is likely to be generated this week. Nothing like fresh carrots to speed along the consumption of lettuce, and local carrots rock. 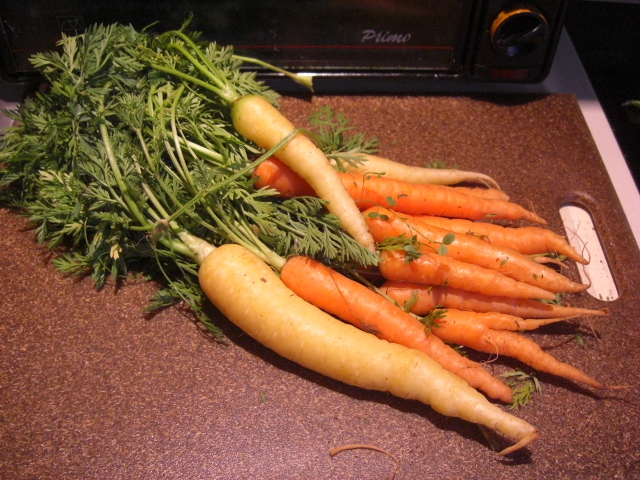 They have flavor that I’d forgotten was associated with carrots – rich and almost buttery. You can cook and roast carrots by themselves or with other vegetables, but Chris and I like them best raw. So most of these will become relished carrot sticks. Sadly, I’ve never found a use for carrot greens. Some people say you can use them like parsley, but I don’t think these people have ever had parsley. Any other ideas? Because we got the heads up to expect some serious lettuce, I ordered carrots from the online store for this delivery, too, along with a baby butternut squash. I get cranky in the wintertime if I don’t get a regular dose of butternut squash. 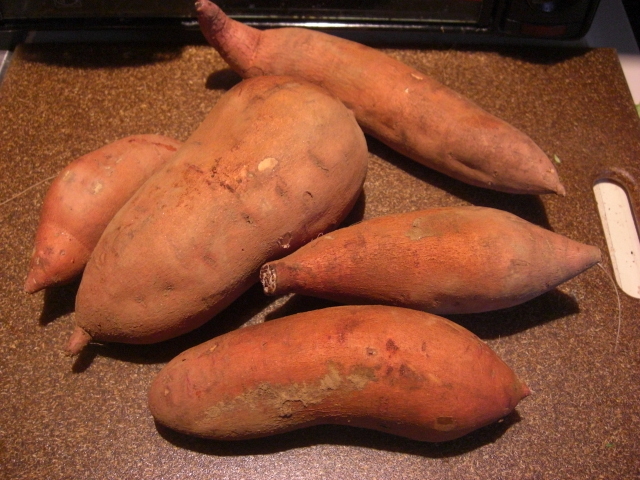 Sweet potatoes are almost as good as butternut squash. These guys are in much better shape than the sweet potatoes from the last delivery, so they don’t need to be cooked right away. (I’ll keep an eye on them, though, just in case.) Whenever we get to eating them, we’ll have them peeled, chunked, and roasted. We’ve given up baking sweet potatoes whole – not because they’re not good but because chunks tossed in olive oil, salt, and pepper are so much better. Plus, I think we use more of each potato that way. Check out the gorgeous broccoli. The best part is the heads are perfect serving size. How’s that for convenient packaging? And don’t chuck the stems. You’ll probably need to peel them, and you’ll definitely need to cook them longer than the heads, but they contain just as much delicious broccoli flavor. Yep, delicious broccoli flavor. 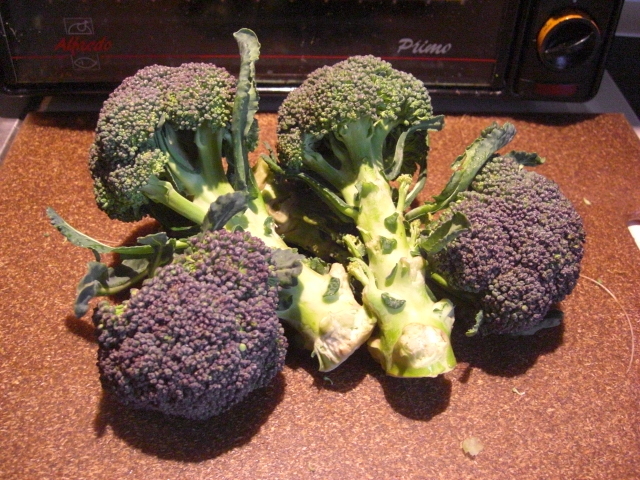 Just like carrots, local broccoli has a wonderful flavor that has leached out of our collective consciousness over the years. I think so many veggies are this way. They were once delicious, but when they started being mass-produced, things other than flavor were more profitable to select for. Over a couple of generations, we’ve forgotten that vegetables are supposed to be yummy. Chris remembers his great-aunts rhapsodizing over vegetables when he was a little boy. At the time, he thought they were crazy, but now he understands what they were going on about. The little leaves are good, too. 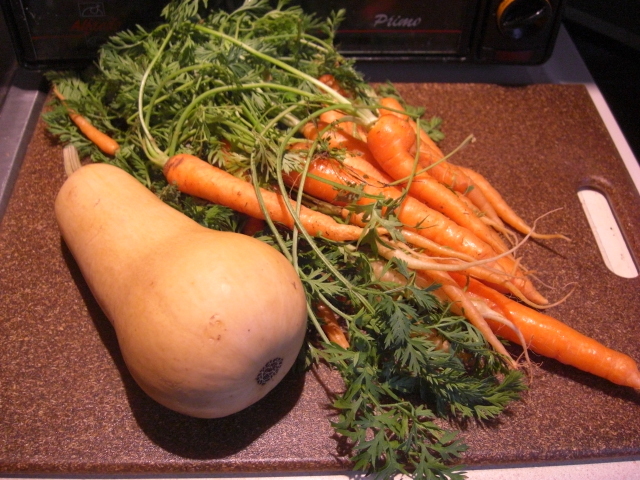 Chop and put them in a salad or add them at the end of cooked carrots. 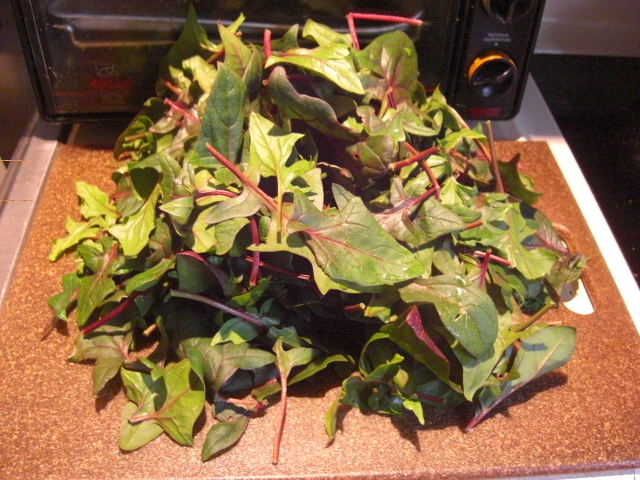 In addition to the lettuce, we got a bag of Bordeaux spinach. Bordeaux spinach has a sweet, pecan-y flavor that’s a real treat. I’m not sure how we’re going to get to spinach salad, too, but we’ll do our best. I’d hate to cook this yummy spinach when it’s so good raw. What I really would like to do is heat up some raspberry vinaigrette, cook some bacon, combine the two, and toss the spinach in the hot dressing. Par-cel, a.k.a. cutting celery, is an herb that tastes like celery. So it’s wonderful to have as the base of any dish that’s starting with sautéed onion or garlic or both. 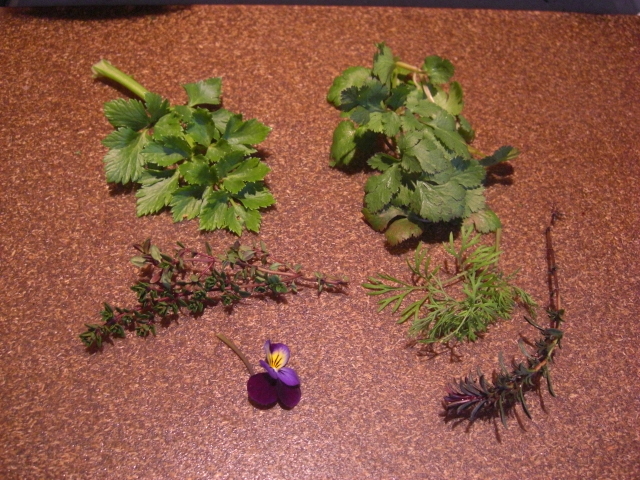 Just dice the leaves and stem and add it to the mix. You could put it in salad, too, but I think that would be a waste. The dill can go in salad, but if you’re planning on cooking some carrots, try finishing them with chopped dill, instead. The winter savory will be perfect on roasted sweet potatoes in place of pepper. Thyme is my favorite herb and goes with so many good things. (Here’s a list of thyme recipes to give you some ideas.) 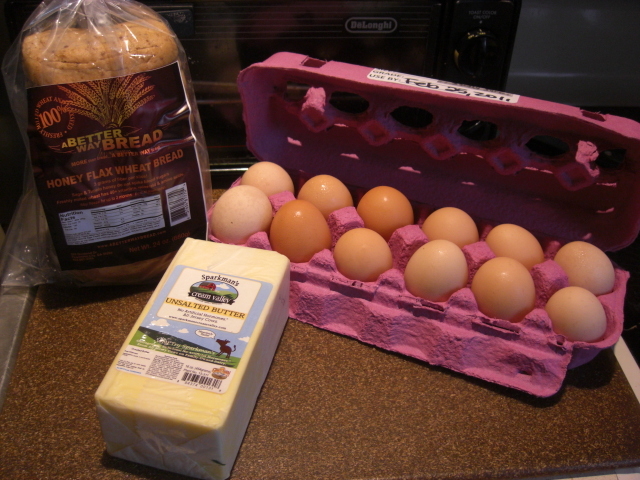 My plan is to make a compound butter and put off choosing a specific dish for now. I’m only going to make a quarter pound, and I’ll probably stick to just thyme… although the winter savory would be a good addition and I have some rosemary in the garden. We’ll see how it goes. The exciting part is compound butter can live in the freezer for six months, so it sounds like a great way to make herbs last. 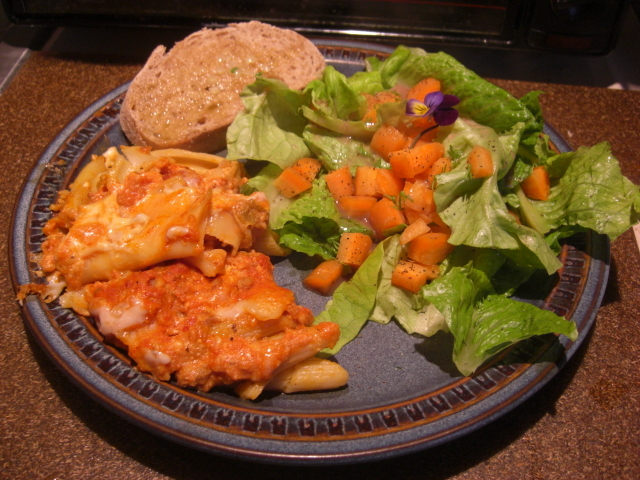 Tonight, Chris and I began our salad marathon with lettuce, carrots, dill, and the Johnny-jump-up along with some garlic bread and leftover baked pasta. Fun was had by all.